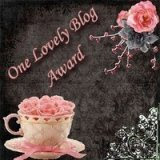 Brooke, who I absolutely love by the way, gave me this blog award. She is so funny, smart and very athletic, which I admire, because I'm not! I'm supposed to recognized the sender and then pass it on to 15 other bloggers. But y'all know me, I never can pick just a few. I think everyone that I read has something wonderful to offer and trying to choose would be like me trying to pick which cheese cake is my favorite. So here's to you ladies...everyone of you take this award and post it on your blogs. And now y'all are stuck with trying to pick 15 bloggers to send it to. It's harder than you think!